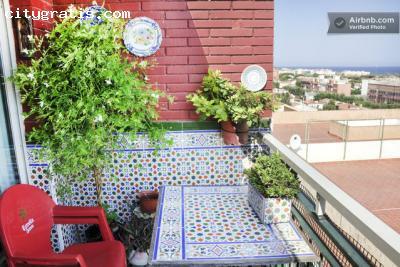 Youth room with excellent sea and mountain views, in the pretty village of Premia de Mar. I'm 10 minutes from the train station, and 30 minutes (by train) from central Barcelona. Each 10min train passes. cafe or tea is included as breakfast. Internet, 17'' screen, and the possibility of receiving a massage, reflexology, etc.. with a 20% discount on the price as rates. You can use the microwave to heat or cook a meal, and there is also possibility laundry service, or request some other service. (Not included in the price), as breakfast, half board, picnic or full board.